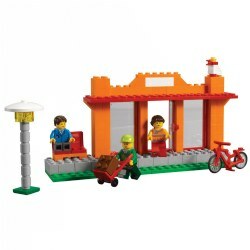 Kaplan offers a range of LEGO® products, including city, farm, vehicles, and house themed sets. 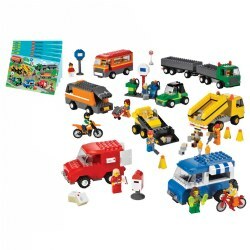 Also included are colored building plates, community people, and LEGO® Creator transportation vehicles. 3 - 5 years. 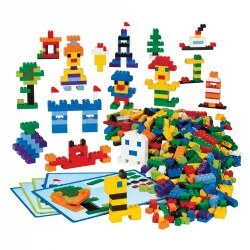 Set children's creativity free with this imaginative LEGO® DUPLO® set. Not only will it inspire big ideas in young minds, it will encourage self-expression and develop fine motor skills as they build, deconstruct and build again. Building cards provide support and inspiration so children can enjoy building fun! 160 pieces. 4 years & up. 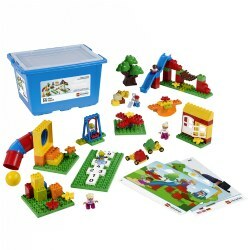 Stimulate children's natural curiosity to explore and learn with this versatile brick set. 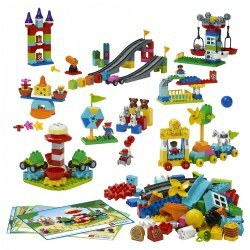 This set allows children to create all sorts of life-like or imaginary figures, objects, and buildings. 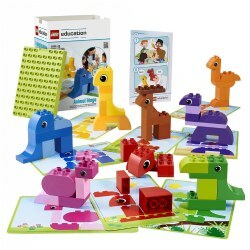 Children develop fine motor skills while constructing and the building cards will support and inspire their creativity. Where will their imaginations take them? A handful of LEGO® bricks can turn into absolutely anything! 1,000 pieces. 3 - 6 years. 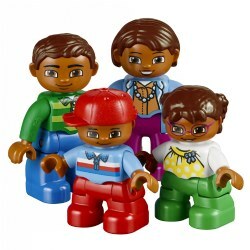 Transform your children into expert builders! With the Tech Machines set in your classroom, you'll help children develop their fine motor and problem-solving skills while simultaneously unleashing their creativity as they construct classic machines. Storage box included. 95 pieces. 3 years & up. 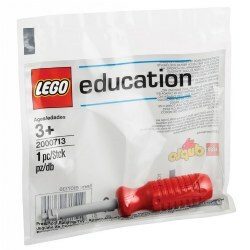 Pack includes a replacement screwdriver for the LEGO® Tech Machines set (item #89854). 1 piece. 3 - 6 years. Stimulate children to play and collaborate as they construct various food items and learn to sort, count, match, and pattern. 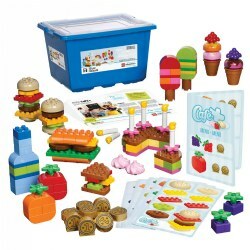 The unique and colorful bricks, as well as menu and recipe cards, inspire language and role play around restaurants, shopping, and people's needs. 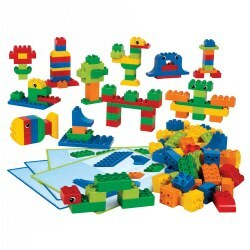 Children will naturally be practicing basic math as they play with this engaging set. Storage box included. 131 pieces. 2 - 5 years. 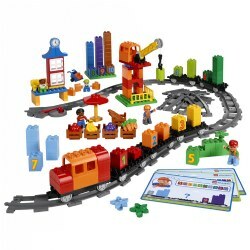 Discover counting, patterns and simple addition and subtraction with a fun and imaginative set that also teaches the purpose of stations and trains. 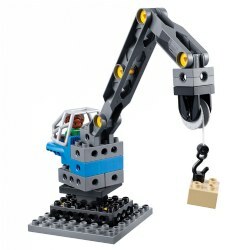 Children will role play exciting transportation scenarios as they use the crane to load and unload colorful train cargo and construct stations along a delivery route that they create! 167 pieces. 2 - 5 years. Everyone is a winner with Animal Bingo! Children will explore collaborative play, follow game rules, and take turns as they build the colorful animal models depicted on the game cards. They will engage in shape and color recognition, match and count animals, and learn to follow instructions in a fun and engaging way. 49 pieces. 3 - 6 years. Promote creativity, imaginative storytelling and language development with this unique and engaging storytelling set. Children will naturally collaborate and develop speaking and listening skills as they build their stories and role-play. Anyone can tell a story with StoryTales! Storage box included. 109 pieces. 18 months & up. Watch children explore their creativity as they collaborate and construct! 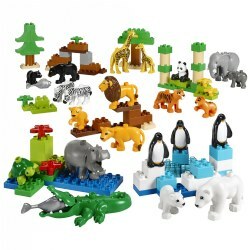 This set includes more than 500 pieces, which let large groups of children build together and inspire one another as they construct animals, buildings, vehicles, or anything else they can imagine. Focus on shape and color recognition, counting, and patterning for developing early math skills. 562 pieces. 4 years & up. Explore the exciting world of wheels! 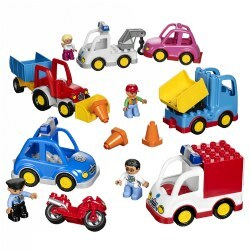 The set lets children create and role play with a variety of vehicles that represent all kinds of transportation and travel. They'll learn about the roles and responsibilities of vehicles in their communities as they further develop their fine motor skills. Storage box included. 934 pieces. 4 years & up. Take off to an exciting world of play! Children work together to build and create stories about transportation and space travel as they further develop their speaking, listening, and fine motor skills. 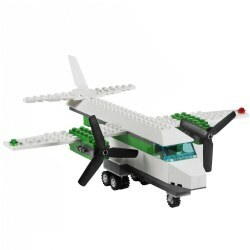 The bricks and special elements make it easy to construct fun, unique buildings and vehicles. Storage box included. 1,176 pieces. 4 years & up. Spark children's creativity as you encourage building and storytelling. The very large set lets children build settings, models and characters as big as their imaginations! After they construct together, children will tell and listen to stories, enhancing their language development along the way. Storage box included. 1,207 pieces. 4 years & up. 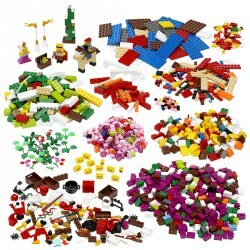 So many pieces, so many possibilities! This set encourages children to communicate and collaborate, as they construct communities that exist in their imaginations. 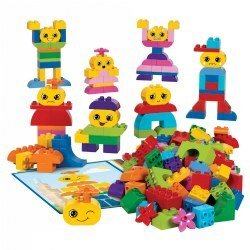 As they play, they will develop fine motor skills, learn how to express themselves, and explore the world they live in. Storage box included. 1,907 pieces. 2 - 5 years. Deepen children's understanding of relationships as they construct a familiar place where they can explore the concepts of friendship, feelings, and community. 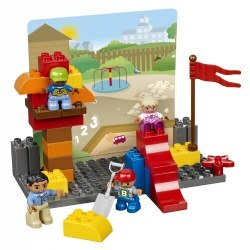 The set encourages creative play and imaginative storytelling as it inspires children to role play around important and practical ideas like sharing equipment, conflict resolution, and playground safety. Storage box included. 104 pieces. 2 - 5 years. Explore the world through the power of creative play! By role playing both familiar and new exciting travel scenarios, children will learn about transportation, discover the importance of interpersonal relationships, and explore our place in the wider world. 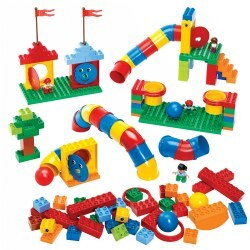 It also is a great way to expand existing LEGO® DUPLO® sets! 32 pieces. 2 - 5 years. What's life like on a farm? With the Large Farm Set, you can explore together! The set invites children to construct and role play in this exciting world as they build their collaborative and language skills. They can even work on early math skills by sorting and categorizing the animals. Storage box included. 154 pieces. 2 - 5 years. Encourage children to explore the world they live in through different people and occupations. 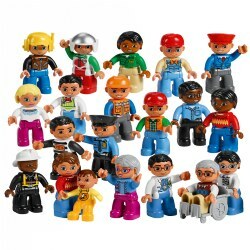 As children role play and talk about each of the 20 unique characters in the set, they will learn important lessons about gender, age, relationships, and the unique roles and responsibilities people have in their communities. 21 pieces. 2 - 5 years. The World People Set is a powerful tool which encourages discussions about respecting similarities and differences among people. The set invites children to role play with four different families and opens their minds to exploring cultures, gender, age, and family relationships. 16 pieces. 2 - 5 years. Invite children to explore the world through animals and animal families and habitats. As children construct a home and setting for each animal, they will learn about what animals need to survive and how they are different from one another. You can even introduce early math through sorting and categorizing activities. The possibilities are endless! 104 pieces. 18 months & up. Every creation needs a foundation! 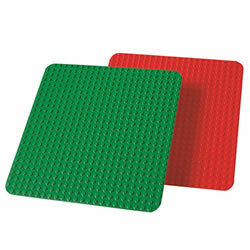 Two large building plates -- one red, one green -- provide the perfect foundation for learning through play. 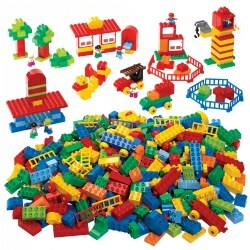 Can be used with all kinds of LEGO® DUPLO® based products. Size 15" x 15" (38 cm x 38 cm.) 2 pieces. 4 years & up. Every creation needs a foundation! This set includes one gray 15" X 15" (38 cm x 38 cm) building plate, two green 9.8" x 9.8" (25 cm x 25 cm) building plates, and one blue 9.8" x 9.8" (25 cm x 25 cm) building plate. 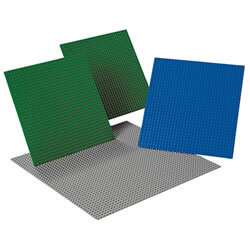 Each of these durable building plates forms a solid base for all LEGO® building bricks. 4 pieces.